There's a Card for That: So Much Cake Shaker | ft. MFT's "Beary Special Birthday"
So Much Cake Shaker | ft. MFT's "Beary Special Birthday"
It happens every time. Every birthday; that delicious cake is just staring at you and you want to just gobble the whole thing up. We've all been there. Normally we don't actually do that. It wouldn't be proper. Someone forgot to tell that to this little guy. To begin, I stamped this sweet little bear from MFT's "Beary Special Birthday" with Memento Tuxedo Black ink on 110lb Copic-friendly cardstock. 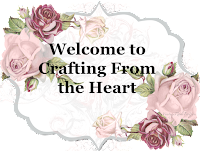 I then used my largest oval die to do some partial die cutting, I fussy cut the space around him. I then coloured him with Copic markers, I used some Glossy Accents by Ranger over the icing of the cake and then dipped it in the Clear Rock Candy Glitter. I lined up the top panel with the bottom to determine where I wanted the balloons. They are also from the same set, stamped with Memento ink and coloured with Copics. I used a very light shade to colour background behind the balloons and the same shade to make some diagonal lines on the front panel. I added a piece of acetate behind the window and created my shaker area with doubled up foam tape. I filled the space with sequins and chunky glitter and stuck them together. I thought it needed a little something more so I created so stitch lines with a thin multi-liner. Finally I adhered the entire thing to a standard A2 sized card base. For the banner I die cut a piece of cardstock using the mini banner die from Lawn Fawn's "Magic Color Slider" die set. I hope you like today's card and are inspired to create something of your own. If you haven't all ready, please follow me over on the right side bar; if you are viewing this via mobile device, scroll to the bottom and click "View web version" first. You can also follow me over on Facebook. Toss me a line in the comments section below and let me know what you think. Hi, Trina! Your beary special birthday card is as cute as can be! I love your pretty coloring, and the delightful happiness you bring out in the design. Great take on the MUSE challenge, too! So glad I got to see your critter project showcased at the 2 Crafty Critter Crazies Challenge. Thanks for joining us, and we hope to see more of your pretty creations in the future. Please check back to see if you are a winner. Sending you wishes for a wonderful day! what a great shaker! I love that adorable bear and all the brightly coloured balloons! Thanks so much for joining us at Muse this week! Fabulous shaker card, Trina! 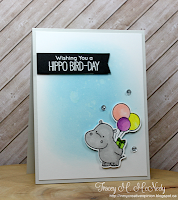 I'm in awe of the perfect, partial die cut and fussy cutting around the stamped image! So adorable; great job of coloring; lovely interpretation of Tracey's Muse card. Trina your shaker card is absolutely fabulous, awesome colouring! 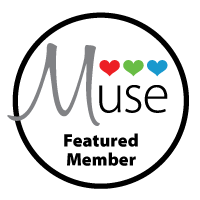 Thank you so much for sharing with us at Muse this week!